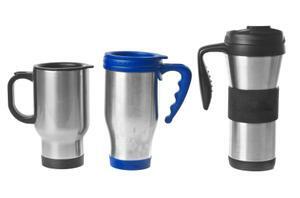 The best traveling coffee mugs are well-insulated so that your daily caffeine jolt stays hot as long as possible. The cups also have a narrow enough bottom to fit comfortably into most cars' cup holders without the likelihood of them toppling over. In addition, the best mugs will be unlikely to spill or leak all over your clothes as you make your way to work. Consumer Search voted the Contigo AutoSeal Stainless Steel Travel Mug ($20) as the best thanks to its durability, its insulation, and its prevention of spills and leaks. Reviewers said that coffee stays hot inside for up to four hours and fits in the average car cup holder. The mug isn't dishwasher or microwave safe. This travel mug ($30) was appropriately named, according to reviews. Mark's Technology News claims that it's leakproof even when shaken upside down. The review also claims that when it housed boiling water for two hours, the temperature only dropped by nine degrees. There's no handle and it's a slim cup, so it should fit easily into the cup holder. Consumer Search voted the Aladdin Recycled and Recyclable Mug ($9) to be the best plastic mug you could buy on a budget. It will also make those who want to be good to the environment happy. You can throw it into the dishwasher or microwave, and the inside is BPA free. It won't, however, win any medals for keeping your coffee hot the longest, or for being absolutely spill-proof. Good Housekeeping voted the Thermos Nissan Tea Tumbler with Infuser ($23) to be one of the best mugs for coffee and tea drinkers alike. Good Housekeeping also voted the Oxo Good Grips LiquiSeal Travel Mug ($22) to be one of the best mugs out there. Opening and closing the spout is as simple as pushing a button, making it convenient for on-the-go coffee-drinking. It holds about four ounces less than many of the other mugs on the list and it's also wider than many of the other models. Reviews for the Planetary Designs mugs ($18) overall are promising, with users stating that their drinks stay hot for hours. One reviewer of a discontinued model on Amazon.com said he could make tea in the morning and still sip it warm in the afternoon. The mugs are generally slimmer at the bottom than the top, so they can fit into cup holders. With 377 reviews on Amazon.com, this mug ($24) still gets 4.5 stars. The description claims that it's lightweight, durable, keeps drinks hot for at least an hour, won't leak, and it's comfortable to hold. There is also a five-year warranty against defects on Nissan Stainless products. If you're traveling with a backpack, you won't have to worry about having your hands full; this mug clips onto your backpack. When choosing the best traveling coffee mug for your lifestyle, consider whether you'll be traveling on foot or in a car. Decide how important it is to be able to toss it into the dishwasher at the end of the day, or to microwave its contents. Also decide just how long you need your coffee to stay hot. If you want to sip it all day, you'll want to look for those that ensure hours of insulation over those that say they'll keep beverages hot for around an hour. There is no best mug for everyone, but there are several out there that work very well to be comfortable to hold and to travel with (without spills or leaks, of course) while keeping drinks hot as long as you need them to.